Using your hands, rub the lamb all over with the lemon juice. Pat the garlic and rosemary evenly all over the surface of the meat. Season the meat with the salt and pepper and place the lamb in a roasting pan. Place the lamb in the oven and roast for 30 minutes. Reduce the oven temperature to 350 degrees F and continue to cook for about 1 hour longer for medium-rare, or until a meat thermometer inserted into the center of the roast registers about 145 degrees F to 150 degrees F (be careful that the thermometer does not touch the bone.) 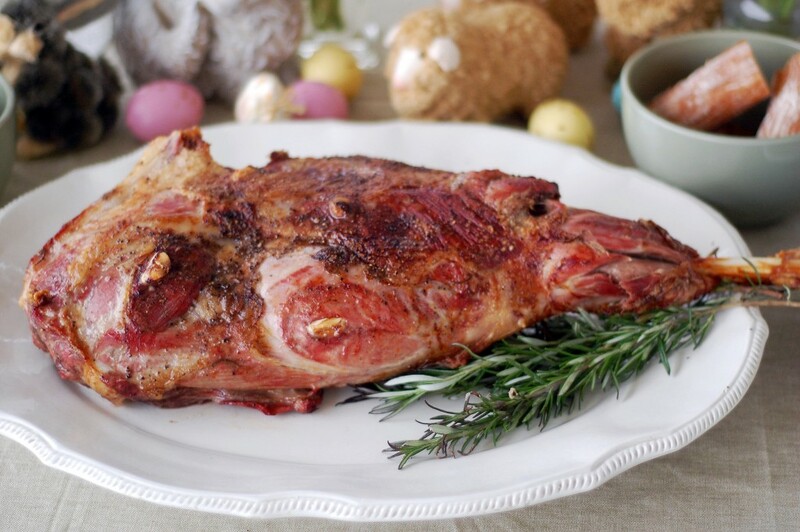 Remove lamb from pan and allow to rest for 10 to 15 minutes before carving. Position the roasting pan over your stove burners. Add mixed herbs and onions to pan, and stir to combine with pan drippings. Add chicken stock and wine to de-glaze the pan, scraping the bottom with a wooden spoon to release any fond. Reduce over high heat until sauce consistency. Strain before serving, if desired. Slice lamb and serve with sauce drizzled over the top.